The West Point Association of Graduates is pleased to announce that actor and humanitarian Gary Sinise will be presented with the Sylvanus Thayer Award for 2015. The award will be presented on October 22 during ceremonies hosted by Lt. Gen. Robert L. Caslen, Class of 1975, Superintendent of the United States Military Academy at West Point. “I am humbled to receive the Sylvanus Thayer Award from The West Point Association of Graduates, and want to thank them from the bottom of my heart for recognizing my support of veterans and active duty military,” said Sinise. “To be recognized with such a distinguished honor is truly a privilege and I hope that this recognition only helps to further shine a light on the continuing mission of supporting those who serve and defend our great country." 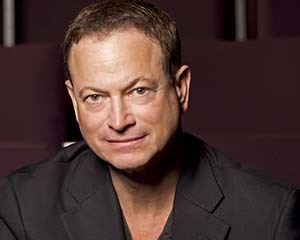 During his distinguished career as a film and theater actor and director, Sinise has won many accolades, including an Emmy, an Obie, and a Golden Globe Award, and he has been nominated for both an Academy Award and a Palme d’Or. Sinise co-founded the Tony award-winning Steppenwolf Theatre Company in Chicago in 1974, and his first major critical success as an actor was in 1982 when he directed and starred in Steppenwolf’s production of True West, for which he earned an Obie Award. He later appeared with John Malkovich in the PBS American Playhouse production of the play. Sinise has starred with fellow actor Tom Hanks in three critically-acclaimed films: Forrest Gump, Apollo 13 and The Green Mile. Beginning in 2004, he starred as Detective Mac Taylor in his first regular television series, the crime drama CSI: New York. It was Sinise’s portrayal of Lieutenant Dan Taylor in the 1994 Academy Award-winning film Forrest Gump that created an enduring connection with U.S. servicemen and women throughout the military community. After participating in several USO tours, Sinise formed the “Lt. Dan Band” in 2004 and began entertaining troops serving at home and abroad. The band now performs almost 50 shows a year for military bases, charities and fundraisers supporting wounded warriors, Gold Star families, veterans and troops around the world. Sinise has frequently used his artistic abilities to enhance recruiting and educational programs that support the military services. He narrated Army and Army Reserve ‘Army Strong’ recruitment ads in 2008 and was the executive producer—along with David Scantling—of the Iraq War documentary Brothers at War. The film features an American military family and the experiences of three brothers: Jake Rademacher, Isaac Rademacher, Class of 2000, and Joseph Rademacher. He has also loaned his voice talent as narrator to several military history documentaries, including the acclaimed World War II in HD on the History Channel and Missions That Changed The War on the Military Channel. In addition to using his acting skills to help tell the story of America’s servicemen and women, Sinise has also served as their passionate advocate off screen for over 30 years. His activism began in the early 80’s with his support of Vietnam Veterans and the creation of Vets Night, a program offering free dinners and performances to veterans at the Steppenwolf Theatre in Chicago. His commitment continued into the 1990’s, when he began working on behalf of the Disabled American Veterans organization, which he continues to actively support. Since the attacks of September 11th, 2001, Sinise’s dedication to our nation’s active duty military, veterans and first responders has intensified into a personal campaign of support, service and gratitude to all those who serve our country. In 2011, Sinise established the Gary Sinise Foundation to honor those who serve the nation and their families by creating and supporting unique programs designed to entertain, educate, inspire, strengthen and build communities. These include its R.I.S.E program (Restoring Independence and Supporting Empowerment), whose flagship initiative is a specially adapted custom Smart Home building project for severely wounded veterans.